While attending the University of Illinois in Chicago, Whitney Dineen was discovered by a local modeling agent and began an unexpected career as a plus-size Ford model. She modeled in New York City before moving to Los Angeles with her husband. During “The Hollywood Years,” Whitney was bitten by the writing bug and started creating characters that are inspired by strong women with a great sense of humor. Whitney's first romantic comedy, She Sins at Midnight, won a silver medal in the 2015 Reader's Favorite Awards. Her second, The Reinvention of Mimi Finnegan, won a silver medal at the 2016 Reader's Favorite Awards, Honorable Mention at the London Book Festival and is also a finalist in the 2016 RONE Awards. Her third rom com, Mimi Pus Two, was a finalist in the 2016 Reader's Favorite Awards. 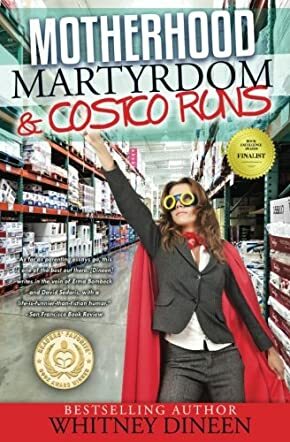 Motherhood Martyrdom & Costco Runs is a nonfiction collection of humorous stories about life, written by Whitney Dineen. The author is the mother of two young daughters who do not treat her as the queen she had always expected her children to treat her as, but who rather see themselves as royalty elevated to her level -- which she actually kind of admires about them. Much of the action in this memoir takes place, as one would expect from the title, at Costco where provisions, free food samples and ice cream sundaes punctuate anxious and repeated visits to Costco restrooms, moments of serenity spent admiring, and counting, the wall of toilet paper and generally reveling in the orderliness and organization which is apparent in every aisle and on every shelf in that vast, echoing warehouse. Motherhood came relatively late in life for Dineen, whose ambition to be a young, cool mom yielded to the vagaries of nature and the realities of the excruciating torment and unexpected rewards implicit in raising two small children. Each of her essays brings the reader more fully into the lives of her and her two daughters as they navigate their passage through childhood together. And while Dineen makes no bones about having a disorderly house at times and harboring a visceral dislike for those perfectly coiffed and clothed young moms who seem to have it all together, one can’t help but get the feeling that her two little girls won the parent jackpot. Whitney Dineen’s nonfiction memoir on parenthood, Motherhood Martyrdom & Costco Runs, is dedicated to “all you breeders out there.” Having no plans to ever fall into that category, I wondered at first how involved I could possibly get with the theme of this collection. I had read and reviewed several of the author’s other works and enjoyed them, however, and found myself looking forward to reading this nonfiction offering -- in spite, or perhaps in defiance of the title. But as I read this disarming, honest and hilarious book, my thoughts invariably went back into the past to my tenth grade English class. Mrs. S was brilliant, funny and the consummate English teacher and mentor. In between getting us to appreciate Shakespeare, O’Neill, Dickens and Wilder, Mrs. S painstakingly taught us how to properly fold and read the New York Times and other full-sized newspapers, and introduced us to William Safire and Erma Bombeck. Bombeck’s world was indeed an alien thing, based upon my experiences as a teen, but somehow she bridged that yawning chasm so effortlessly as she shared her world view with me and demonstrated how easily she could get me to laugh and care along with her. Mrs. S and Erma would probably get the biggest charge out of Motherhood Martyrdom & Costco Runs. It’s beautifully written and a joy to read, even the parts that are embarrassing for some Victorian throwbacks like the author’s husband. While the title and even the dedication seem to imply a specific subsection of the public may want to read this, I’ll beg to differ and recommend it to everyone, breeders, non-breeders, even those whose sense of humor is somewhat challenged, as mine is. Dineen works a bit of magic here in this authentic, inspiring and very human collection of humorist writing. Motherhood Martyrdom & Costco Runs is most highly recommended. In Motherhood Martyrdom & Costco Runs by Whitney Dineen, readers are introduced to some of the wonderful qualities and realities that make parenting all the fun it’s supposed to be. The author calls it the three “Es” of parenting—exhilarating, exhausting, and explosive. In this slim but wonderful book, readers will rediscover or will discover the joys and perils of parenting delivered by a bestselling author who writes from inside her own personal experience. For Whitney, what was it like to be a mother? The answer will surprise many readers as they journey with the author on her own motherhood experience, involving the stress and the depression, the frustrations and the startling discoveries, and above all, the things that make motherhood one of the noblest vocations for women—the sheer joy of living it. There is a lot in this book that reminds me of my own relationship with my kids. Whitney Dineen has a unique way with words and her signature phraseology comes across powerfully throughout the work. In a sweet, compelling, and strong voice, the author shares her hard-won lessons on parenting, unveiling a huge treasure for new parents and anyone seeking advice on successful parenting. The writing is very accessible and it is sprinkled with a lot of humor. As the author talks about the excitement of getting pregnant, the depression that comes just after giving birth and the wonderful adventure with growing kids, she allows readers to connect with her experience. She uses her real life stories and beautiful prose to deliver insights that will help mothers anywhere to transform their parenting into a meaningful and fulfilling experience. Motherhood Martyrdom & Costco Runs was fun for me and I am passing it on to my wife as a gift. It will inform, encourage, and educate new moms on their parenting journey. I have one word of advice for anyone preparing to read Motherhood Martyrdom and Costco Runs before they get started: use care where you read this book. The reason is simple. You see, you are likely to laugh out loud . . . repeatedly. So I suggest you keep that in mind, should you plan to read it on a plane, bus, or in any public place. In it, Whitney Dineen sets out a series of vignettes relating around her and her husband, Jimmy, as well as their darling “littles,” Margery and Hope. Several of Dineen’s stories are set in Costco, her favorite place to shop—as it comes complete with a floor to ceiling wall of . . . toilet paper. Notwithstanding that base charm, Costco does not come without setbacks. There, Dineen’s littles always wanted to visit the restroom—conveniently located three-and-a-half football fields away from wherever they might have been in the store at the time—where they could revel in the perfect acoustics. After all, what better place is there for yodeling? Whitney Dineen oozes honesty in Motherhood Martyrdom and Costco Runs that could cost her friends—should those folks included in her stories fail to appreciate the humor she intended to share, or to accept the forgiveness that she seems at times to seek for having made “judgments” about them in the past (judgments that she discovered were unfair, as she balanced her way through the young years with her two daughters). I laughed along as Dineen told of the shock her littles had upon discovering that their mother had grown up without life’s little necessities—like stickers, Dollar Stores, and home computers capable of printing out coloring pages. I identified completely when she discussed how her littles simply could not stop talking. And I understood (perhaps a bit too well) when she told of such things as her periods of postpartum depression, and of her sensitivity to sounds. Along the way, I laughed frequently, and heartily. As laughter makes for good medicine, I encourage you to grab your copy of this little gem soon. We could all use a little humor and a little healing!